Last weekend I had the pleasure of having my brother Jason and his girlfriend Whitney assisting with lessons for the first time. 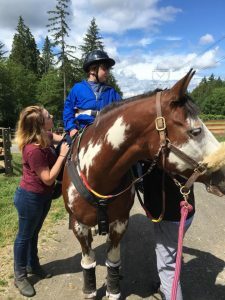 It’s always a treat to hear new perspectives on my teaching, especially from someone who doesn’t have experience with therapeutic horseback riding. After the day’s lessons concluded, Jason, Whitney, one of our weekly volunteers, Grace, and I had a great discussion. The one topic that felt the most important was when to talk to the rider and when to give the rider time to process what’s going on around them. Some might mistake the lulls in communication as gaps in instruction or a lack of lesson planning; however, these lulls serve a purpose. The majority of children that we work with are on the Autism Spectrum, which is why this talk will mostly lean towards students with this diagnosis. I do however believe that my thoughts cross over into many diagnoses that include both developmental and physical delays. There are many reasons that I am quiet during a lesson, including: giving the child time to process instructions, achievements, or a task they have completed. Not only do the students need to understand and respond to me but they also need to do so with the horse. A lot of my students are working on. “if I do this, then I get this,” which includes a lot of trial and error. 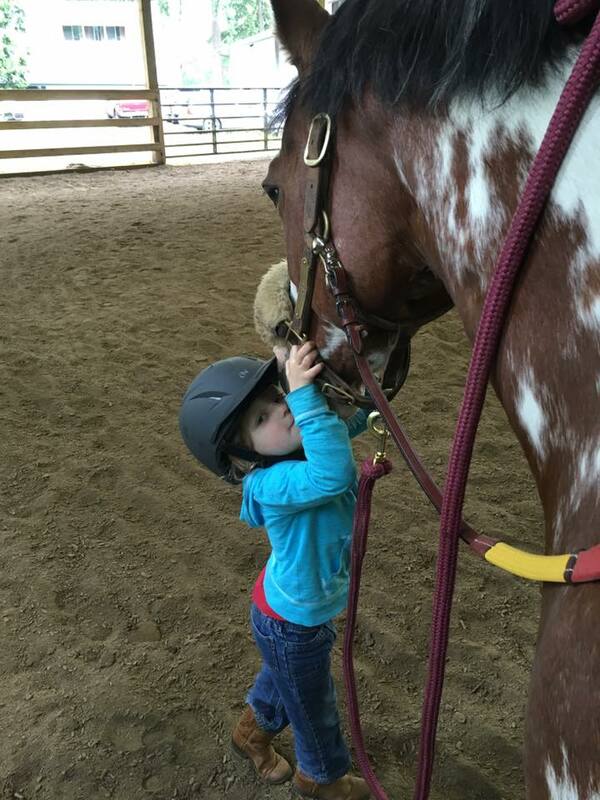 If we are working on 2-point down the long side and I ask the rider to look up, I will explain how this changes their center of balance and ask the student if they can feel it. After this exercise, I’ll give the rider a long side to relax and process before we try it again. With some students, this does not work because they get distracted by the horses in their paddock, fiddle with their reins, or start talking to their side walker. If the rider is distracted, we acknowledge the distraction and redirect their attention back to the task and if needed, move along quicker. Sensory overload is another reason why I may be quiet during a lesson. If a child comes to their lesson and seems overwhelmed, I try to start the lesson quietly. 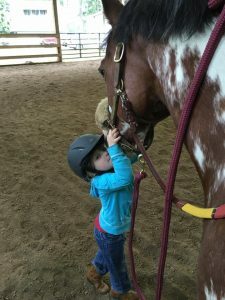 Starting the lesson quietly stops the addition of more input which is important because the child is already getting input from the horse’s movement, the side walker, the tactile feel of the saddle, and the other numerous distractions that exist around the barn. Typically after a few laps around the arena these inputs have settled down and the rider can focus on their lesson. During these first few laps I provide compliments such as, “you are holding your reins in a great position, not resting on your saddle with your thumbs up and elbows bent, great job!” Or, I give the student some relaxing instructions, such as, “feel the rhythm of the horse and relax your legs so they can swing with the movement.” While these comments aren’t exactly rocket science, they help to set the tone for a relaxed and smooth lesson. The last reason that I want to touch on that explains why I am quiet during a lesson is that I am dealing with an overly excited or hyperactive child. The barn has ground rules that include no running or yelling; however, I feel that in most cases, actions speak louder than words. When I am calm, thoughtful, and fair, the child takes notice and relaxes into a calmer pace. 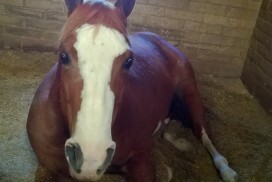 When working with a horse that is overly excited or anxious, the best thing to do is remain calm. If your energy increases to meet theirs, things only become more escalated. Taking this principle, I apply it during lessons and let overly excited, hyperactive, or extremely nervous riders adjust themselves to their surroundings. I have worked hard to set a calm and quiet rhythm at Empowering Strides to keep our riders safe. This doesn’t mean that students aren’t allowed to talk though; I allow students to sometimes talk during their warm ups, I ask them questions, and let them talk about their hobbies. Not only does this let the students connect, but it allows them to speak their mind without taking their attention off of the lesson. I’m going to wrap this up with a few great snippets from The National Autism Society’s webpage on “Communicating and Interacting”, guidance on communication and interacting with your autistic child or family member. You can find this page here. Caring for someone who’s autistic can be hard work and time-consuming. It can be tempting to rush the person when they are performing daily tasks such as eating breakfast and getting dressed. Spare an extra few minutes for these tasks to help them understand what’s happening around them and to think about what they can say during these activities. Follow the person’s lead, rather than directing them. They will be more likely to pay attention to the activity, more likely to focus on the same thing as you, and will learn how to make choices for themselves. Limit the amount of words you use to communicate the relevant information. Use key words that are specific to the context of the situation, repeat and stress them, and use gesture such as pointing, to accompany the words. If the person has only recently begun to use speech as a means of communication, use single words. Pause in between spoken words and phrases to give the person time to process what has been said, and to give them an opportunity to think of a response. Why Do New Students Start In Private Lessons? Accepting Applications for DDA/DSHS Scholarships!